Last Saturday (13th January) was National Make Your Dreams Come True Day. Over the last 7 years we, at Si Spain, have helped 100's of families realise their dream. Whether that was to permanently relocate to warmer climes, or to simply spend more quality time with loved ones in their brand new holiday home here in Spain. If you yearn for a more relaxed, outdoors lifestyle. If you dream of being able to enjoy sun filled days at the beach with your family whenever you please, then you may already be asking yourself “How do I make this dream a reality?" “When you think of a big goal or dream that you want to achieve, it's natural to think of all of the obstacles that will come your way. The problem is far too often we allow these obstacles to become so big in our minds that it inhibits us from moving forward. This is when many become satisfied with mediocrity. Don't let this be you." Be sure to include everyone and use this visualisation process as a way to ensure each member understands the others' reasons for wanting to make the dream a reality. Together, you can then determine the whole group's fundamental 'why's' and enable everyone to focus on all the positive aspects of your common goal. Don't just focus on the physical features, but also discuss how you want and expect to “feel" once it becomes a reality. Not overly commercialised with a good mix of nationalities but predominantly still an unspoilt Spanish region. A truly diverse area with mountains, national parks, beach resorts, golf & leisure resorts, modern shopping centres, cultural and historical cities. How did we want and expect to feel? Brainstorm – This term can conjure images of trendy, creative, marketing types all thinking “outside the box" or “imagineering" innovative new ways of flogging us the latest gizmo. But in this case, it just means everyone sitting around a table blurting out the first thing that pops into their head whilst one person wildly scribbles them all down on a large standard piece of non “imagineered" paper. Remember, no comment or idea is off limits at this stage. This is meant to allow you to get everybody's raw, unfiltered thoughts out in the open ready to be discussed and rationalised later. Ideas in a hat – This is great way to get younger family members involved. Get everyone to privately write down a reason why they want it and another piece of paper saying how they want it to make them feel. Pull all the ideas from the hat and read them out loud. Then discuss each point to create that one common goal that you all want to achieve. Create a Vision Board – Elizabeth Rider from the Huffington Post say that “creating a sacred space that displays what you want actually does bring it to life. What we focus on expands." 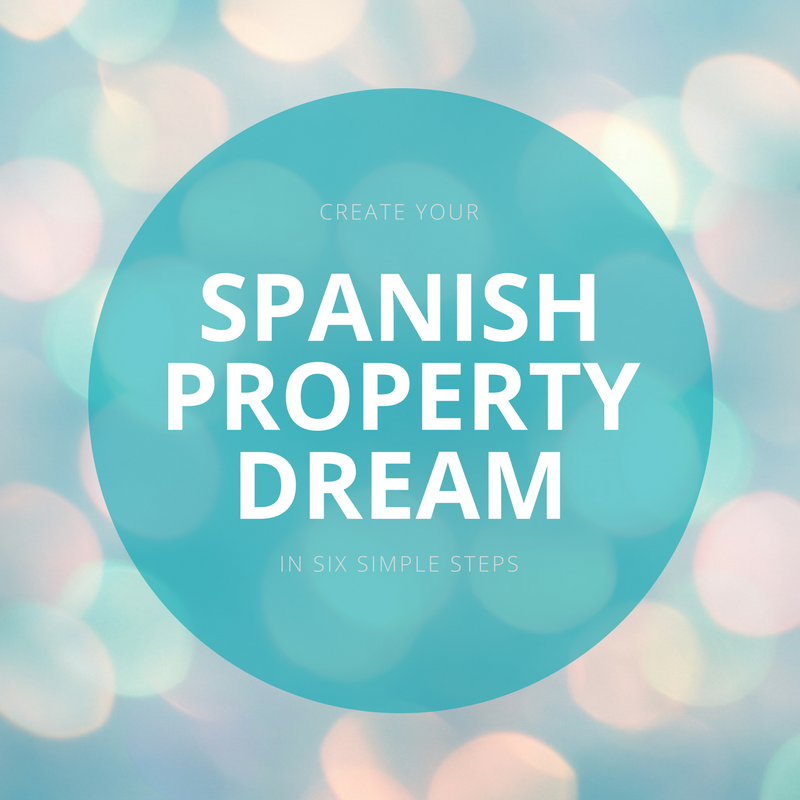 So make a vision board specifically for your Spanish Property Dream. Search on the internet, print off images of properties that you see yourself living in, cut out vistas from magazines and find quotes that conjure up the feelings that you want to feel. Frame it and place on the wall, in a location where you will all see it from time to time, and when you do, take a moment to stop and visual that goal. “Repeating mantra aids in that manifestation of personal contentment through repetition of focused, conscious desire." Allow yourself time to create a 25 word Dream Mantra that you won't forget. Make sure you include the whys, a feeling specific to the location and something memorable about the location. We like this idea for when you have those down days, or even need something to replace “the counting sheep" method during a sleepless night! Having this one, simple statement will get you back on track and make you realise that the rubbish day you may have just had is one reason why your present is the path to your ideal future. So…eyes closed, legs crossed, hands together and repeat after me “Aaaooooom!" Sometimes you just need a good old nudge in the right direction. If your dream is to buy a property in Spain, then find property consultants who can help make your dream a reality. A few conversations will lead you to the right professionals for the job. For us, we like to work with straight talking people, who favour relationship building over a well-versed sales patter. We find we can add much more value to our clients search if we start by shutting up and listening carefully to what you are trying to achieve. As my dear old dad use to say “you have 2 ears and 1 mouth so use them in that ratio!" Go visit your area of interest again. See if those feelings become a reality when you are there (like that feeling of having sun on your face, or hearing the waves). Take pictures to add to your vision board, especially ones of you and your family, take notes of the places you like, as well as the places you don't. For example, Si Spain offer complimentary Inspection Trips. This is a usually a two night, 3 day stay for two people who are serious about buying a property here in the Costa Calida, Costa Blanca or the Costa Almeria. As well as viewing a selection of carefully selected properties, a first visit to the area should primarily be focused on identifying the right locations for you. By visiting all the diverse areas and their key points of interest we can gauge your reaction first hand and get instant feedback from you, helping us to understand more about your specific requirements. This means we are then better placed to assist you in your search and can also use our local knowledge and experience to save you wasting time viewing areas and properties that are not just for you. This approach also helps you get a real taste of how you would spend your time here in Spain rather than just being rushed from one property to the next without experiencing what the surrounding area has to offer. Life rarely goes 100% according to plan. Changes in your personal circumstances or adverse movements in market conditions, such as increasing prices or lower currency exchange rates (thank you Brexit!) can make your dream feel suddenly out of reach. When faced with new challenges caused by events beyond our own direct control it can sometimes be easier to believe the universe is telling us that something is just is not meant to be. Instead of telling us to abandon the dream we prefer to think that it may simply be suggesting some small adjustments need to be made to the overall plan. As long as you stay flexible and dynamic in your approach these seemingly high hurdles blocking your way can often be easily stepped over like small puddles on the path to achieving your dreams. You must of course stay true to the fundamental reasons and feelings driving you. However, simply re-evaluating your real needs and slightly altering your criteria accordingly really shouldn't make too drastic a change to your realisation of a happier life. On the other-hand, giving it all up because you couldn't achieve 100% of your criteria could leave you harbouring some serious long-term regrets. Income & employment – If you are relocating permanently how easy will it be to find work or create the required income to live the lifestyle you want. Healthcare – The national healthcare system in Spain is one of the best in the world but you need to be aware if and how you can access this or whether private insurance is a better option for you. Legalities – Buying a property in Spain is straightforward and safe but you need to know all your tax and legal obligations before you go ahead. Running costs – There are costs associated with running both a permanent residence and a holiday home in Spain. These aren't as high as the UK but again you need to go in with your eyes wide open. Family & Friends - This is not boring, but it if you plan to emigrate then it is extremely important to know how leaving friends and family could affect you and how it may impact on them. Whilst this may seem a little like the “buzz killing" section of the piece by researching all the practical, financial and legal aspects thoroughly it will actually re-enforce your desire to move forward and make turning your dream into a reality feel even more achievable. Now that's a great feeling! The reason for visualising your dreams and aspirations and for planning is to abruptly stop the doubts when they do pop into your head. So, enjoy planning your dream of buying a property here in Spain and if you want to discuss your dreams and goals in more detail feel free to get in touch with us anytime. We have many years of professional knowledge and personal experience of the region to share and will be more than happy to answer any questions you may have about the area or the property market here.